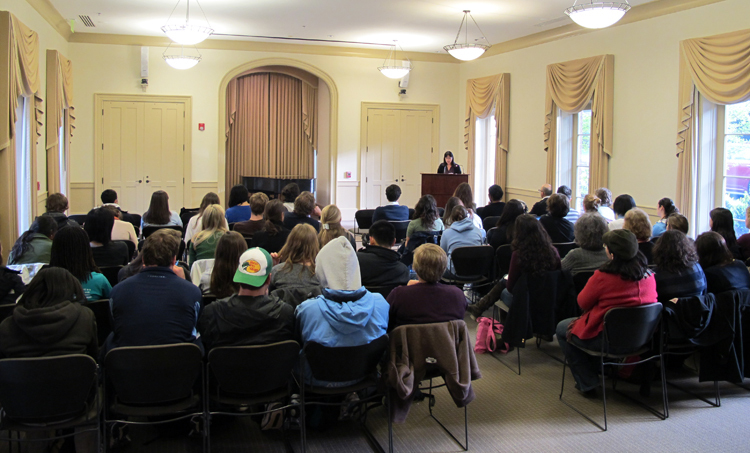 The first of its kind at UNC-Chapel Hill, the LSP Cultures Speaker Series begun Fall 1999. It is dedicated to exploring Latina/o Studies as a transdisciplinary endeavor that draws on, among other areas of inquiry, literary and cultural studies, visual culture and media studies, creative writing and performance studies, philosophy and aesthetics, history, sociology, comparative ethnic studies and postcolonial studies, Americas studies, health and environmental studies, and gender and sexuality studies. It has served to create dialogue between ethnic studies areas on campus. Encompassing the more traditional areas of Latina/o Studies such as Chicana/o, Puerto Rican, and Cuban/American studies, the series also includes other areas: Dominican, Central American, and South American. Moreover, the series explores difference in terms of ethno-national and regional diversity, gender, sexuality, race, class, religion, language-use, and generation. Beyond exploring “difference” for the sake of “diversity,” the series is part of an ongoing critical examination of intersectionality and interconnected for the purpose of advancing social justice agendas in various areas. The series invites specialists in different areas of Latina/o Studies and related fields from all over the country to UNC-CH throughout the academic year.The series has hosted creative writers and scholars addressing the intersections between Latina/o and African-American cultural production, between specifically Chicana/o and Native American Studies, and common ground (LatinAsia or AsiaLat Studies) between Latina/o Studies and Asian Diaspora Studies. The UNC-CH Latina/o Culture(s) Speakers’ Series is sponsored by the UNC-Chapel Hill English Department and the College of Arts and Sciences. Dr. Maria DeGuzman is the conceiver and organizer. Past speakers include Silvio Torres-Saillant, Achy Obejas, Kirsten Silva Gruesz, Frances Aparicio, Arturo Arias, Antonia Darder, Suzanne Oboler, Loida Maritza Pérez, and Junot Díaz, among others. I want to learn more about the LSP minor. I want to get involved with LSP. The Latina/o Studies Program supports the University's core values encouraging diversity and equal educational and employment opportunities throughout the University community. These values are articulated in the University's non-discrimination policy and by the office of Diversity and Multicultural Affairs.